It's an age of astonishing technological progress—but are we starting to have a harder time coming up with new ideas? That, they argue, is because researchers are putting in more and more effort to sustain the same—or even a slightly lower—pace of idea generation as we experienced half a century ago. 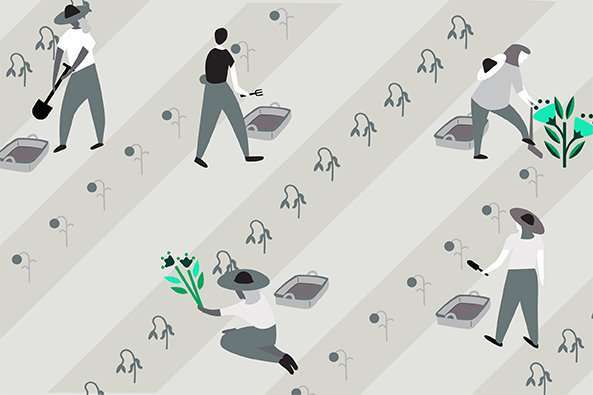 "Just to sustain the constant growth in GDP per person, the U.S. must double the amount of research effort put into searching for a new idea every 13 years to offset the increased difficulty in finding new ideas," write MIT Sloan professor of applied economics John Van Reenen, Stanford University professors Nicholas Bloom and Charles I. Jones, and Stanford doctoral candidate Michael Webb. Moore's Law—the observed doubling of the number of transistors packed onto new computer central processing units every two years—stands as a prime example. The doubling effect represents a growth rate of 35 percent each year, and that growth is driven only by ever-more-extensive research, the authors write. "Many commentators note that Moore's Law is not a law of nature, but instead results from intense research effort: Doubling the transistor density is often viewed as a goal or target for research programs," they write. They continue: "The constant exponential growth implied by Moore's Law has been achieved only by a massive increase in the amount of resources devoted to pushing the frontier forward." 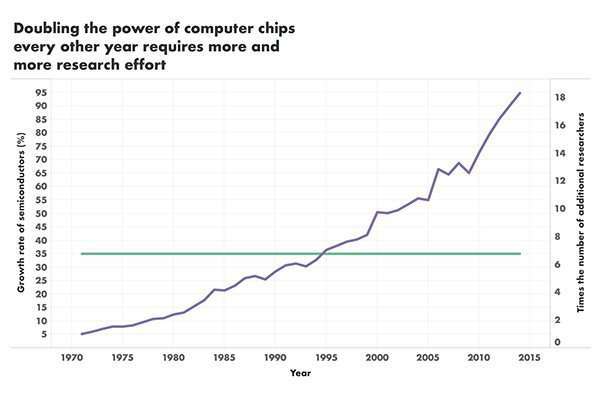 In fact, research efforts toward semiconductor improvement have risen by a factor of 18 since the early 1970s, the study found, while productivity has fallen by the same factor. Taken together, that means it's about 18 times harder today to push Moore's Law forward than it was half a century ago, the authors write. "It is … evident … that research productivity has fallen sharply for agricultural yields," the authors write. "Yield growth is relatively stable or even declining, while the effective research that has driven this yield growth has risen tremendously." 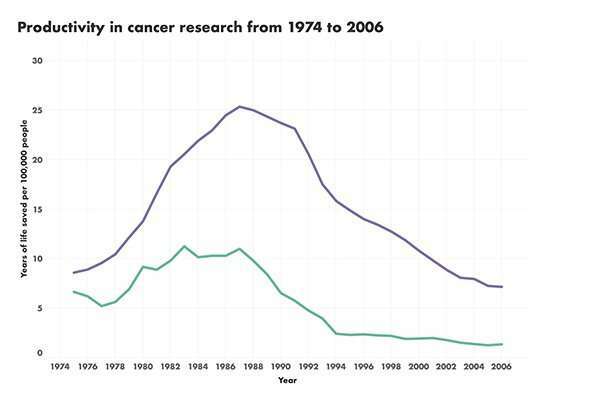 But cancer research productivity actually rose between 1975 and the mid 1980s, the authors note. "These cases suggest that it may get easier to find new ideas at first before getting harder, at least in some areas." Van Reenen said one factor that could explain the trend is that it's simply taking longer for researchers to achieve the level of education they need to make a breakthrough discovery. "As the total amount of knowledge becomes larger and larger and larger, it becomes increasingly difficult to get to its frontier of that knowledge," Van Reenen said. "It was much easier a couple thousand years ago." Narrowing the focus of one's studies to specialize in a very particular domain has emerged as a common workaround to that problem, Van Reenen said, but that strategy breeds its own set of issues. "In order to carry on innovating, you're constantly working together, and it's very complicated to get all of these people and ideas together," he said. "That, itself, could be a reason why things start slowing down." "As long as we keep increasing the amount of resources we put into research, we'll keep doing that," he said. But that requires continuous investment of national GDP, and he worries the impetus to do that hasn't been as strong lately. "The concern I have is that the investments are not being done. I think a lot of the time you hear we'll just cut the top tax rates to generate lots of innovation—I'm pretty skeptical about that in terms of the incentives you're going to give," he said. "Both have positive effects on growth and equality. Instead of giving away $5 trillion in tax cuts, use that to invest in growth opportunities for the future," said Van Reenen. These economists are not claiming that big new discoveries are not out there anymore. Rather, they are claiming that big new ideas are harder to find and develop because there is so much more knowledge that needs to be learned before scientists can tackle big problems, and then the problems are so much more complicated that it takes much more analysis and work to find new discoveries. This type of thinking is a variation of marginal-cost vs marginal-revenue analysis that is fundamental in economics. It's often useful, but in this case it does not fully contemplate that in the future (and sometimes now) most of the work in scientific discovery will be done by AI, robots, and other machines. As a result, vast amounts of analysis, testing, and production will be done by machines at a fraction of the cost if done by humans. I have an idea... I can make an audio file 1,000 times smaller than an MP3 with no compression. But I am afraid to patent it because of our corrupted patent office. New functional ideas are easy to find. It's when the desire to maintain and hold the current structure of ownership and it's expectations in the future, for it..when that drive comes into play, then progress can be drastically slowed. This is due to the 'new' that is attempting to be.. that new is likened to a break from the old. There are only so may ways a given system can advance linearly from where it is whilst maintaining the same structure. The idea of functional discovery must also include near or complete breaks from the old systems. Then the rates of advance --might increase again. I am an idea guy. But I think we could go with no changes for awhile so, so many people aren't left behind. All this change is unsustainable and not stable.